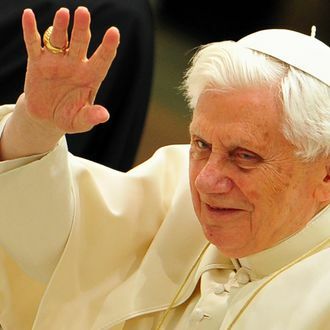 Since taking over at the Vatican in 2005, Pope Benedict XVI has had his share of public relations problems. Take, for example, those outrage-spurring statements about the founder of Islam being “evil and inhuman,” or the pardoning of that Holocaust-denying bishop, and, of course, the constant mismanaging of the Catholic church’s many child abuse scandals. More recently, they’ve been dealing with a papal butler’s decision to leak a host of embarrassing internal documents. Today, the Vatican announced that they’ll be taking on these and future issues with a new and improved communications strategy molded by Fox News’s now former Rome correspondent Greg Burke, who will become the Holy See’s senior communications adviser. Burke is a member of Opus Dei, though he wouldn’t say whether he thought that had anything to do with his appointment, because Opus Dei is full of secrets. “Am I being hired because I’m in Opus Dei?” he asked. “It might come into play,” he said while noting that he was “also in Opus when he was hired by Time and Fox.” We’ll leave it to the world’s conspiracy theorists and remaining Da Vinci Code obsessives to figure out what that means.